Hollywood hotshot Lady Gaga opened her mouth and removed all doubt she is just another misinformed wannabe. Like the pundits who rushed to convict Trump for a BS story in Buzzfeed, Hollywood and especially Lady Gaga went after Karen Pence in a vicious manner for the sin of taking a job. She basically called Mike and Karen Pence frauds and the Vice President did not let that stand. He promptly wiped the smirk right off Gaga’s face w3ith a brutal lesson in the U.S. Constitution. From Yahoo. This week, Second Lady Karen Pence took a job at a private school that seeks to exclude homosexual and transgender students and staff members. 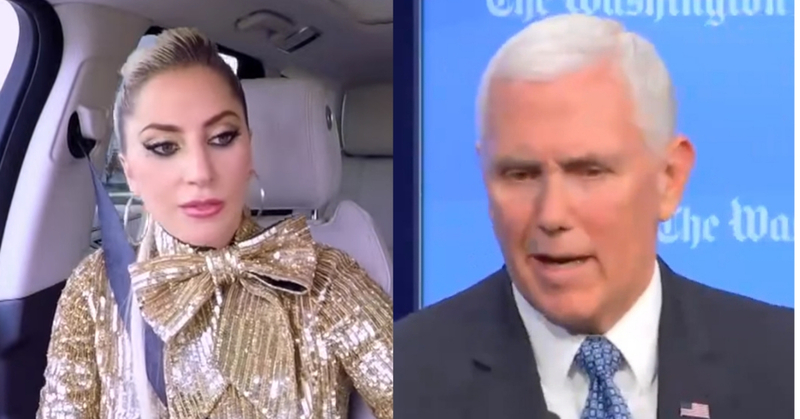 Lady Gaga, herself a staunch advocate for LGBTQ equality, ripped both Karen Pence and her husband, Vice President Mike Pence, during a concert in Las Vegas on Saturday Night. While performing the song “Million Reasons”, Gaga paused to say: “To Mike Pence, who thinks it’s acceptable that his wife work at a school that bans LGBTQ, you are wrong. You say we should not discriminate against Christianity; you are the worst representation of what it means to be a Christian. He added, “We have a rich tradition in America of Christian education and, frankly, religious education broadly defined. We celebrate it.